Margaret of Parma, the regent of the Netherlands, had a coarse stiff beard. Women who went to war years ago wore false beards. In Roman days, women were forbidden from shaving their cheeks to get beards to grow. The witches in MacBeth were bearded. In 1853 Barnum’s New York Museum featured a bearded lady. And in 14th century Portugal, when a teenaged girl named Wilgefortis prayed to become repulsive so she wouldn’t have to marry a pagan king, her beard grew in overnight; the engagement was cancelled, and the girl’s angry father had her crucified! Wilgefortis became a popular saint known as Uncumber in England, Liberata in Italy and France. She was especially revered by women who wished to be liberated from abusive husbands. 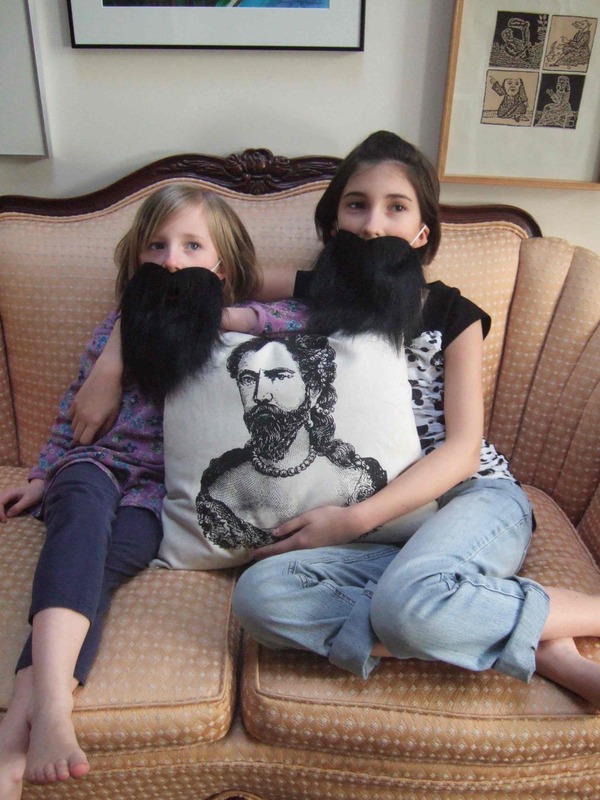 My “bearded” granddaughters with a bearded lady pillow. Thank you for this book! What a conversation piece it was for us at dinner. Elenamaria seemed to enjoy the book. She liked how he “did his own mind, not what everyone else said he should do”. It reminded her a little bit about the book “Bad Case of Stripes”.